This was flat out ugly. How do you lose to the Huskies with two weeks to prepare? UCONN Started 3rd string QB (Red-Shirt Freshman) Cody Endres who took care of the ball and looked pretty good against the Bearcat D. Unfortunately the 'Cats turned the ball over six times, and they allowed Donald Brown to Rush for 150 yards. This one Hurts!!! On a side note, Pitt lost to Rutgers and Louisville upset S. Florida today. Looks like WVU is the team to beat in the B. East! UC can't afford another loss to win the B. East. 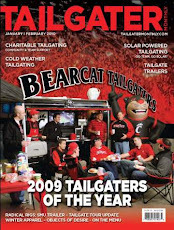 I hope Kelly gets the boys ready to play S. Florida under the lights at Nippert on ESPN this Thursday. While we didn't have much to cheer about... we had plenty to eat and drink thanks to the Holy Grail in Clifton.